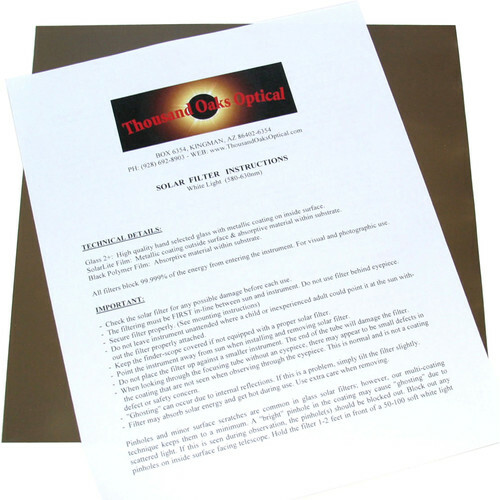 Ideal for making custom filters to fit finders, binoculars, and camera lenses, and other optics at magnification of 100x or less, this 8.5x11" sheet of Thousand Oaks Optics Silver-Black Polymer White-Light Solar Filter Film is CE and ISO 12312-2 certified for safe direct solar viewing - blocking greater than 99.99% of the sun's intense white light, plus 100% of harmful ultraviolet (UV) and infrared (IR) radiation. The protective properties of the film are infused throughout the substrate for greater safety, and views through this film are sharp and clear, revealing the sun in a pleasant yellow-orange color. This filter film is intended for use on the front aperture of the optic or lens, and should never be put behind any lens, eyepiece or finder - including camera drop-in holders behind the lens. Always observe proper safety procedures and carefully follow the instructions to avoid personal injury or damage to your equipment. Box Dimensions (LxWxH) 11.0 x 8.5 x 0.02"